I've written before about Lewis Hine's photographs of child laborers. Joe Manning has embarked upon a Lewis Hine Project. It all began with his collaboration with Elizabeth Winthrop to track down Addie Card, "the poster child of child labor"—a search that made the pages of Smithsonian last year. Manning's website features some Mystery Photos of children still waiting to be identified. For instance, these children. 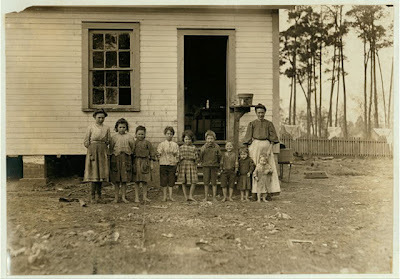 A family working in the Tifton (Ga.) Cotton Mill. Mrs. A.J. Young works in mill and at home. Nell (oldest girl) alternates in mill with mother. Mammy (next girl) runs 2 sides. Mary (next) runs 1 1/2 sides. Elic (oldest boy) works regularly. Eddie (next girl) helps in mill, sticks on bobbins. Four smallest children not working yet. The mother said she earns $4.50 a week and all the children earn $4.50 a week. Husband died and left her with 11 children. 2 of them went off and got married. The family left the farm 2 years ago to work in the mill. January 22, 1909. Location: Tifton, Georgia. Mrs. A J. Young was probably the same living in Tifton in 1920, aged 53 years, with Ben L. and Tiffie Lanier (Tiffie, 33, presumably being one of the children who "went off and got married"). Anyone want to take a crack at finding the family in earlier censuses? Update: Mr. Manning has contacted me, and tells me that it probably was Ben, not Tiffie, who was Mrs. Young's child (the census calls them just "Son" and "Daughter"). He has found that Tiffie's maiden name was "Oliver." That's a really hard one. So many nicknames. Tried tracing Tiffie and other children, but just managed to find Tiffie and Ben in 1910. Tried to follow Ben before that, and have uncertain results for that too. I'm not much good on this one.